I am increasingly convinced that the selection process for magistrates is flawed. During my time on the bench it was common knowledge that there were perhaps 5%-10% of colleagues who were not intellectually or otherwise of a standard comparable with the job. Sanctions were rarely applied. Already this month four magistrates have been before the Judicial Conduct Investigations Office. Of these two have been removed from the magistracy owing to their failure to commit to the minimum number of sittings required and a third for drug possession. The fourth behaved in what only can be described in a crassly ignorant manner not befitting her position and was fortunate IMHO for not suffering the same fate as the other three. Altogether this year twelve Justices of the Peace have been removed from the magistracy the majority for failing to sit the minimum meagre requirement of a half day every fortnight; a schedule which does not allow the skills or knowledge necessary to be embodied in a lay magistrate sitting as a winger and is scandalously too little for a chairman to acquire the skills required. These numbers are not unusual. Every month JPs are thrown out for their unwillingness to devote the time required; a commitment that every appointments committee must surely emphasise. So why does it happen? It is a total waste of time and money to appoint and train somebody who fails at such a predictable hurdle. 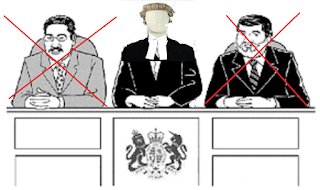 Like so much else within the MOJ`s empire the magistracy I believe is slowly being allowed to whither on the vine. When it finally is killed off in its traditional form our legal system will be so much the poorer.